Imagine yourself walking down a deserted street. It’s late in the day; the sky is dappled and mottled with clouds. The sidewalks are littered with the soggy remnants of December, slush and old receipts. Your thoughts uproot, displaced in time, remembering, projecting. A fine, chill mist falls; you turn your face to the sky, baptized like a thirsty young plant. 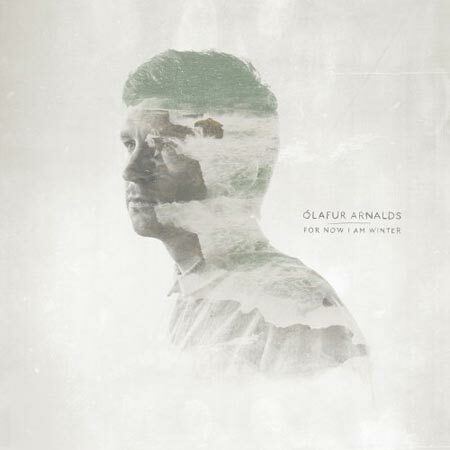 For Now I Am Winter, Olafur Arnalds’ fourth LP (and major label debut) is a poetic meditation on the coldest season. It sounds like a dubstep opera, with crisp electronic flourishes framing gorgeous orchestral arrangements (with the help of American composer Nico Muhly), and a trembling libretto by Arnór Dan Arnársson (of Agent Fresco), with a fragile ethereal quality similar to that of Sigur Ros’ Jonsi. Tense minimalist strings counterpoint chamber music romance as Arnalds conjures feeling of regret, longing, desire, and wanderlust, with the final result being an elaborate reflection on the season, as complex and layered as real life. The record works best as a whole, but tracks like “Reclaim”, “This Place Was A Shelter”, or the title track serve as a fine illustration of this album’s mission statement, and are fine places for the curious to begin. The music itself could be seen as the elements at work; biting winds, sleet, slush, and snow, while the operatic vocals serve as an inner dialogue. Olafur Arnalds has established himself as an accomplished composer with a deft understanding of moods and tones, and it’s exhilarating to watch him expand his palate to include tasteful beats and tasty synth ambiance. For Now I Am Winter stands at a crossroads in time, between the ancient and modern. Clearly, the composer is not content with lo-fi stark modern classical minimalism, and is training his gaze on the future. Some reviewers have made this record out to be ambient background music, and I feel this to be a mistake. People forget that it takes a great deal of time and resources to record and produce a wide array of orchestral instruments, and this alone separate Arnalds from the legions of laptop hacks. He has clearly put in the time, aspiring towards mastery, and it shows. Both the classical and electronic aspects measure up against the competition, and it suggests a way forward for both genres. The only downside, with Arnalds’ smooth-as-Chinese-silk pop arrangements, is that he has sandblasted all the difficult edges off of both styles; there is nothing avant-garde about this release. It will appeal to a wide variety of listeners, but removes the difficult, forward-thinking complexity of the truly cutting edge. Winter can be a time of loss, death, deprivation. In a lot of ways, the first decade of the 21st century seemed like one long freeze, with no thaw in sight. Talk of apocalypse was on everyone’s tongue, as our foremost thinkers predicted economic and cultural collapse. Despair ran rampant, while hope was the scarcest of commodities. Olafur Arnalds’ new record could be seen as a simulacrum of the last 10 years, and it suggests a break in the weather — rays of sunshine cracking over the horizon. His attempt to marry the beauty and mastery of classicism with the deft control available to electronic music suggests a way forward, a future for us all. It’s difficult to talk about things as they’re happening; you’re too immersed in it. It lacks perspective. The fact that Olafur Arnalds is daring to speak of the coldest months mean that they are drawing to a close, and we all can reflect on where we’ve been, and where we’re going. Here in Portland, where this review is currently being written, the trees are bursting like crimson fireworks, but the wet and gloom are still hanging on. We are at a standstill, a stasis, but a new day is nearly upon us. It feels like there is hope for all of us yet, and For Now I Am Winter is a beautiful elegy for the passing seasons.